Hostels are commonly perceived as budget accommodation, often loud and dirty, an option for travellers who prefer to party the nights away. So some of us search out peaceful and quiet hostels around the world and while they are extremely affordable, they also provide cultural experiences, beautiful scenery, and of course, peace and quiet. The Gyreum Hostel looks like a space craft that fell from the sky and got nestled into an Irish hillside. The structure is a little reminiscent of Star Wars, and if looking cool isn’t enough, the Gyreum is also an ecolodge that provides tent accommodations in its giant dome shaped common area. If indoor tents aren’t quite your thing, dorms are available as well. The hostel has wi-fi, a sunken fireplace, and a well equipped kitchen. Combined with its unique spin on accommodations, this hostel definitely deserves the number one spot on this list. Situated in the North-West of Ireland (in Castlebaldwin, Co. Sligo) it seeks to be invisible with its green roof merging with the slope between the plateau of Moytura and the vale of Lough Arrow. Stay in a tent from $22 USD per night. 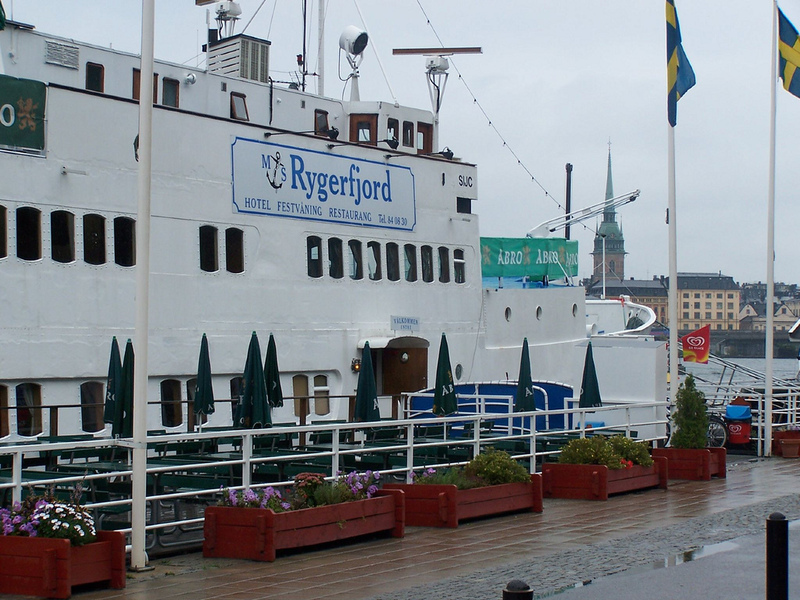 The Rygerfjord Hostel is a former fully functional ship that has been permanently docked in Stockholm on Lake Malaren. Converted into both a hotel and hostel, the ship offers a bar, internet access, bicycle rentals, and a lounge complete with plush leather chairs and wood-trimmed panelling decor. Staying on a boat is an interesting change from land-locked hostels; the views of Stockholm from the water can’t be beat. From $60 USD per cabin per night, enjoy staying at the Rygerfjord Floating Hostel anchored at Soder Malarstrand in the centre of Stockholm, Sweeden. Alegria’s is a beautiful hostel hidden behind a stucco wall and a set of colourful blue doors on a small cobbled stone street. Algegris offers light-infusing glass ceilings, a classic styled kitchen and hammocks in both the central common area and forest-like backyard. An added feature is their private room on the top floor which offers a full city view. The hostel is located in La Candelaria, an area surrounded by Colombia’s most prominent universities where many young and hip Colombians hang out, a short walk from the famous Bolivar square. Stay at Algeria’s Hostel from $10 USD per night. Check out the local shops and bars, or relax in one of the many hammocks at the hostel with a drink in hand. Villa Saint Exupery is a converted Carmelite monastery perched on a hill in a suburb of a French Riviera town. The Von dem Busscher family have sculpted this place into a shining exception to the rule that all French hostels are rubbish. Rooms are stone-floored and en suite, and singles and doubles are available with views over the pine, olive and carob-dotted grounds. The Villa screams low budget luxury. Adorned with purple flowers, stained-glass windows and a cheap drink bar, this spot is ideally located for taking in the splendour of the French Riviera. The old chapel, still with original stained glass windows, is the communal bar area and buzzes with travellers every night. Stay at the Villa Saint Exupery from $25 USD per night. Grab a few French pastries and soak up the ambiance like backpacking royalty. All good hostels have a bit of a story behind them. Nick Lock, owner of Casa Caracol, used to buy hammocks in the Yucatan Peninsula and peddle them in Europe to fund his masters degree in marine biology. Hammock addiction, it seems, is a tricky one to shift, and the rooftop hammock garden at Casa Caracol is testament to the fact the owner is still hooked. Scattered in between the swinging fabrics are jasmine plants, lemon, orange and banana trees, honeysuckle and gardenia, making a delightful bouquet of scents linger in the air at Casa Caracol Hostel. Stay in a hammock for $11 USD per night, or in a dorm for $17 USD per night. Casa Caracol is located at Suarez de Salazar 4, Cadiz, Spain.